"Pies for Social Change . . . Step up to the Plate!" Thus read the headline on the flier that Christina Salter and Chris Peck brought to their respective workplaces early last month. It continued, "We're baking back America one pie at a time. For a $25 (or more) donation to Moveon.org, the DNC, or United for Peace and Justice, we will deliver a homemade, freshly baked pie to your home or office." A native New Yorker, Salter moved west in 1985 to study counseling at the UO. She met Peck in '88 when both worked at Harry's Mother, a youth shelter in his hometown of Portland. 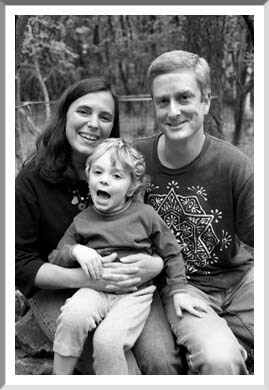 Since '92, the couple has lived in Eugene, where she is now a counselor at LCC, and he works with youth and families through Lane County's Developmetal Disabilities Services. They brainstormed their pie project in response to a "fun-raising" challenge from Moveon.org. "Christina's pie crust is great," says Peck, who peeled and cut apples and peaches. "I rolled the dough out!" adds three-year-old Caleb. Over three weeks, the family baked 15 pies. "It was a nice opportunity to connect with people," Peck reports. "We raised more than we could have come up with personally."